The quarter finals of the number one contender tournament come to an end with Humberto Carrillo versus Oney Lorcan and Akira Tozawa versus Cedric Alexander. The tournament to determine a contender to challenge Buddy Murphy for the Cruiserweight Title at Wrestlemania starts with two quarter final matches: Tony Nese vs Kalisto, and Drew Gulak vs The Brian Kendrick. 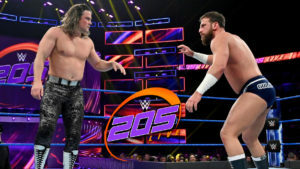 Humberto Carrillo faces TJP, and Mike Kanellis looks for a win against Cedric Alexander in a good episode of 205 Live. Mike Kanellis looks for a victory against The Brian Kendrick, and a number one contender is decided in an elimination match between Rush, Tozawa, Carrillo, and Alexander! 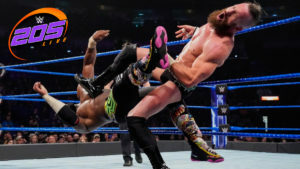 Itami, Tozawa, and Kalisto attempt to prove a point in a triple threat just days before they all compete for the Cruiserweight Title, and Gran Metalik faces newcomer Humberto Carrillo in a good episode of 205 Live.